I saw, I purchased, I tested. 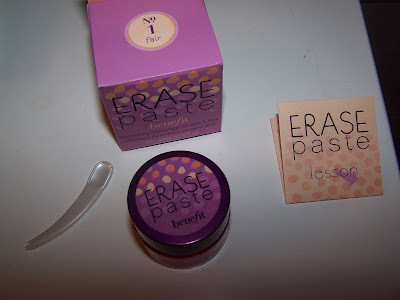 And now I’m about to review Benefit Erase Paste for you! 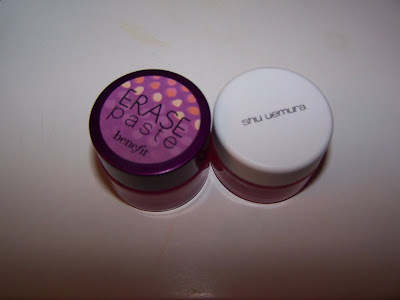 Click here to read my original post about Erase Paste! So I basically spent $26 to test this new multitasking concealer out from Benefit so you guys didn’t have to! Aren’t I the bestest friend in all the blogging world? I have mixed emotions about Erase Paste. It’s not particularly working for me but it may work for you. I think it depends on what sort of skin type you’re sporting, what you’re concealing, how old you are, etc…. You’ve already heard me moan, piss, and whine about how my under eye area refuses to cooperate with me lately. I’ve developed dry skin under my eyes plus a bit of puffiness and fine lines which equals disaster for Benefit Erase Paste. I primarily purchased this to use as an under eye concealer but it’s so thick and blends so horribly that it cakes, creases, and ages my eyes. I was hopeful that the texture and formula would be as moisturizing and as easy to blend as Benefit Boi-ing but this is far more thicker and blending is difficult, lots of tugging involved which I’m not thrilled with. I guess this can be considered moisturizing but the formula feels as if it dries to a powder even though that’s not what it’s doing. It emphasizes the dryness of my eye area terribly which makes me look more older than awake and brightened as it promises. A little goes a long way since the coverage is excellent. It should do a great job if you have dark circles and cover the pesky buggers up completely. I got the lightest shade and it still appears very beige in the jar which I don’t particularly like because it also applies that way. It matches my skin tone well enough but I normally like to go a shade or two below when working on my eye area. This brightens the area up yes but it almost feels and looks like I took my cream foundation (My skin is combo but mostly dry so I use cream foundation) and applied it under my eyes. Very strange! The spatula it comes with is a god sent. I personally wouldn’t want to dip my finger into the jar for obvious reasons but if you don’t mind, hey some of us don’t which is fine, it’d be terribly difficult to get any product out simply because this stuff is so thick you need to use the tiny spatula to scrap it out of the jar. I have some mixed emotions about this since it does make my eye area looks some what rested but honestly my other concealers work much better at doing this without aging my eye area, creasing, or caking up plus they are lighter in texture and the color is a few shades below my normal foundation color where as Erase Paste basically matches my foundation in color almost. The jar this comes in isn’t as large as you might think it is when viewing the promo images. I purposely avoided looking at the size of the jar since I wanted to be surprised at how tiny or large it might be. Turns out it’s about the size of a potted lipgloss. Not so big at all but honestly the product should last you a year or so since you need so little for coverage. My review is based on using this as an eye concealer only. I didn’t try hiding blemishes as I have none and I didn’t try it as a full face brightener as I was wary of applying such a thick cream to my face! You honestly can’t use this on the full of your face in my humblest opinion as it seems like it’ll clog your pores in a major way! 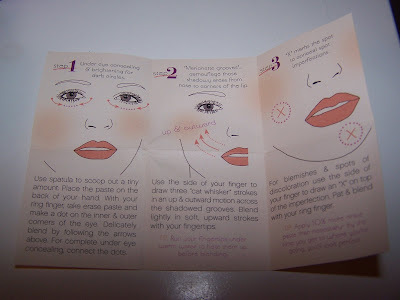 Instruction Pamphlet Included with Erase Paste for different options of use! People who might find this product helpful would be those girls that suffer with little dryness under their eyes. It might be a dream concealer for those of you with super dark circles and no dryness as it may blend easier without dry bits to worry about! So far I’ve used this twice. I can’t give it a completely bad review as I do somewhat like the coverage it gives. This morning after major prepping of my eye area it even blended a bit better then it did the first time I tried it and I’m not experiencing as much creasing. If you prep really well prior to application it blends not so badly however still plenty of tugging involved for proper application. Is it me or do you really hate when people say pat your concealer on? Pat your moisturizer on! I mean seriously in my humblest opinion if I pat on my concealer it looks stupid and if I pat on my moisturizer it pills under my eye! I have to very gently rub with my ring finger and then blot and then pat. I know how bad it is to tug but I do have to gently rub it in to blend correctly! 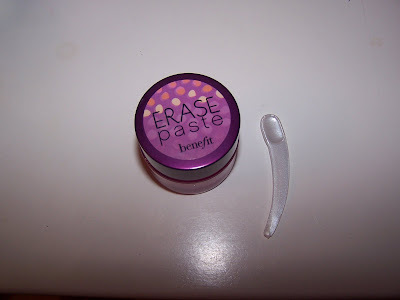 Benefit suggests patting Erase Paste under your eye…ummmm…that isn’t going to work so well! The formula is so thick you’ll look like you’re running around with a layer of beige color cream under your eyes if you just pat and not rub. Girls with younger, fresher eyes! Those of you with dark, dark circles you need to conceal and cover up! Girls with mild acne that wish to conceal a blemish here and there! Those of you who do not have a dry under eye area! Those of you with older eyes. Fine lines, wrinkles, and dry skin beware! Ladies that do NOT like tug on the eye area to blend! I can’t yet give this a Muse Approval for purchase but it’s slowly growing on me. If it’ll ever becomes an absolute staple in my beauty regime remains to be scene but I somehow doubt that! It’s somewhat good but it’s far from being great! I highly recommend stopping at your Benefit Counter or heading to Sephora to test this out prior to purchasing it! I’ll keep you posted as I’ll be using this for the remainder of the week before I deciding if I’ll be returning or keeping it! Click here to read my review of Benefit’s New Throb Powder! 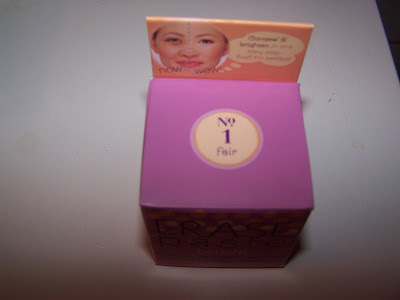 Click here to read my run in and review of Benefit’s That Gal Face Primer! Click here to read my review about Benefit’s Dandelion! Benefit Gogotint A New Cherry Red Stain! Sorry to hear that this didn’t work out! I know what you mean…I can never just “pat” concealer either. My undereyes are really dry and to date I still haven’t found a concealer that doesn’t crease or go crepey on me, and I do use eye cream underneath. So a lot of times I find skipping concealer looks better than having it on. This sounds like it’s trying to be like Kevyn Aucoin’s Sensual Skin Enhancer. I’m sure it falls really short, because his is a moist, yet dense and highly pigmented concealer. I don’t know about under the eyes (boy do I hear you about that area – have you tried Aquaphor for the dryness? ), but it’s a blessing for blemishes and any other redness you may have. I just don’t know about Benefit. They used to have some lipsticks I liked before they reformulated them, but nothing from their line thrills me much. I like the new Cupid’s Bow product, but usually their products range from totally ineffective to just mediocre and overpriced for me. I remember when I was first getting into makeup, I got their catalog, went gaga and ordered a bunch of stuff. I got the package, tried them out and was like, “This doesn’t do anything!” Sigh. Such disappointment. Boooooo! I hate dry concealers. Oh well at least I wont have a lemming for this! Thanks! It’s awful thick isn’t it? As of late I don’t need any help in the fine line area either so adding this to the mix makes for double trouble! The quest for coverage continues! God someone else who can’t pat. It’s the most absurd thing when someone says dont rub…pat…it’s impossible to blend with out some rubbing. I just try to do so as delicately as possible! My eyes are dry too and I think I’m older then you so I’m shocked to hear someone younger has same probs! Have you tried Dior Skin Booster or Dior Hydrating Concealer? Both actually work well for me. They are a bit pricey but worth it for the coverage and the moisture! I just looked up the KA Sensual Skin Enhancer and that stuff looks awesome! I’ve been using Dr. Dennesse Hydroshield lately and it works great prior to my normal eye cream! Do you have dry under eyes? I dunno Benefit is sorta hit and miss for me too. I like a few item s but you’re right most of it is effective. However I do admit some items they have are staples for me. I guess the cheesy packaging makes me want to try it out! Definitely trying that KA Sensual Skin thingy! awww Anonymous sorry to hear it! I understand. Some items just don’t work from Benefit sadly! I think it’s one of those things that is worth trying because you have to experience it for yourself to see if it works for you! When I stopped by my Benefit counter they told me they wouldn’t have the Erase Paste for another 2-3 weeks. I’m glad to know it’s a bust, though; I’ve saved $26. To spend on another useless Benefit chachki. I guess it’s back to my Three Custom Color concealer, for me. It’s not perfect, but at least it can be applied without too much tugging. On a side note: have you tried MUFE’s 5 Camouflage Creme Palette? They don’t last very long but the coverage is incredibly natural and the application is relatively easy, what with the texture and all. I see you’re back in the living and blogging happily 🙂 You were missed! At least your counter knew what you were talking about. I called mine and they were like HUH? Erase Paste? WTF why you trying to confuse us for! I think it’s something you have to try for yourself because it’s…interesting for lack of a better word. So far I’m leaning towards it’s ok and I’m doubting it’ll ever become good or great in my book! I’m back to using my dior booster pen this morning so I guess this gets tossed in the makeup that’s never used bin! Thanks for the comment! I did try it out? 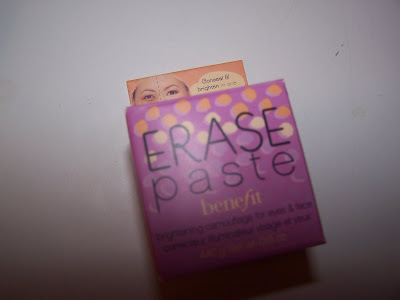 hehe the review is on benefit erase paste that I had purchased thus the photos of the product and long written review lol! oh dear, i don’t think you quite understood my comment! :S i meant that the other girls who said ‘i won’t bother with this because you had troubles.’ i just meant that THEY (not you! hehehe.) should try it out for themselves. ahhh I see Anonymous! I had suggested in my review for them to stop by the counter and have a look at the product. I bought this two days ago. walked out shop dazed at how much I had spent on such a small pot! 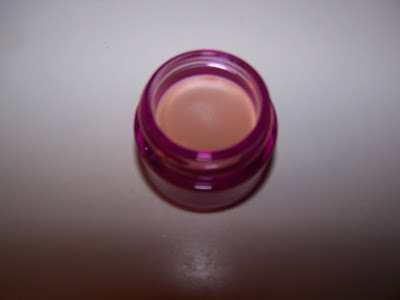 However its the best cover for under my eye area that I have ever used! completely covers the dark patches, I didn’t recognise myself in the mirror. It is completely worth the money, especially if like myself you suffer from a chronic illness which affects your skin, its a little life saver! yay charlie awesome dear! so glad it’s working well for you 😀 that’s awesome news. Sadly it’s a bit too much for me and creases badly!!!!!!!!!! but I def agree it covers like nobody’s biz! hi zelle! mmm same prob for me on boi-ing used to be my favorite concealer but as I got older it dried me out terrible. same problem here with erase paste….it really settles into fine lines badly! I wanted to love it but just couldn’t le sigh! How old are you and what are you looking to conceal 🙂 I can help if I know what your age is and what you’re concealing…fine lines, puff, dark circles…? I’m 25 years old and looking to conceal my dark circles. Thank you Muse! Thank you Muse! I will go out and buy it this weekend! your welcome zelle sadly not at counters doll but qvc carries it. 🙂 it’s ideal for concealing dark circles! Keep your Erase Paste in the sunlight in the summer and in front of a heat register in the winter (24hours a day). The consistency will stay PERFECT and you will never have a product that sits in creases or needs “tugging” to apply. thanks Cynthia sounds like a great tip! I love Erase Paste! If you think it’s too thick or hard to apply, use a soft small brush to apply and blend it. 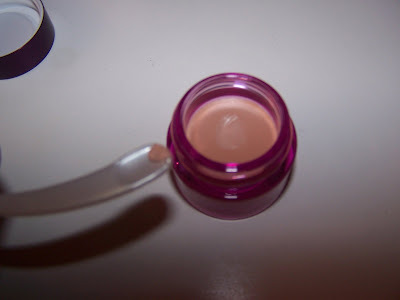 It is perfect for covering dark circles, or even not-so dark circles. You can also dot a bit over a blemish if one pops up over night. Always clean and moisturize your face, morning and night…including your under-eye area. Wait a minute or two for your undereye moisturizer to set, and then apply a small amount with the brush and yay! No more circles, and no settling into fine lines and/or wrinkles. Also works great covering tattoos, scars, birthmarks, etc. A little goes a long way!!! I have to say I disagree. I just started noticing that average concealers are starting to sit in the fine lines around my eyes and I am NOT happy at all about this! I was on the search of a more moisturising product and found this. It covers any darkness under my eyes and blemishes on my face. It’s a thick product but that’s one of the reasons why I like it, if I wanted a thinner product I would just use a liquid foundation. This review was awesome! I love this product, and when you explained “people who might love this product”, I said yes to them all! Great job! thanks bella 🙂 glad it was helpful!